Japanese gardens (日本庭園, nihon teien) are traditional gardens whose designs are accompanied by Japanese aesthetic and philosophical ideas, avoid artificial ornamentation, and highlight the natural landscape. Plants and worn, aged materials are generally used by Japanese garden designers to suggest an ancient and faraway natural landscape, and to express the fragility of existence as well as time's unstoppable advance. The idea of these unique gardens began during the Asuka period. Japanese merchants witnessed the gardens that were being built in China and brought many of the Chinese gardening techniques and styles back to Japan. Today, the tradition of Japanese garden art is still popular around the world, with many eastern and western practitioners expressing themselves through the medium. Japanese gardens were also strongly influenced by the Chinese philosophy of Daoism and Amida Buddhism, imported from China in or around 552 . Daoist legends spoke of five mountainous islands inhabited by the Eight Immortals, who lived in perfect harmony with nature. Each Immortal flew from his mountain home on the back of a crane. The islands themselves were located on the back of an enormous sea turtle. In Japan, the five islands of the Chinese legend became one island, called Horai-zen, or Mount Horai. Replicas of this legendary mountain, the symbol of a perfect world, are a common feature of Japanese gardens, as are rocks representing turtles and cranes. The earliest recorded Japanese gardens were the pleasure gardens of the Japanese Emperors and nobles. They are mentioned in several brief passages of the Nihon Shoki, the first chronicle of Japanese history, published in 720 . In the spring of the year 74, the chronicle recorded: "The Emperor Keikō put a few carp into a pond, and rejoiced to see them morning and evening". The following year, "The Emperor launched a double-hulled boat in the pond of Ijishi at Ihare, and went aboard with his imperial concubine, and they feasted sumptuously together". And in 486, "The Emperor Kenzō went into the garden and feasted at the edge of a winding stream". The weakness of the Emperors and the rivalry of feudal warlords resulted in two civil wars (1156 and 1159), which destroyed most of Kyoto and its gardens. The capital moved to Kamakura, and then in 1336 back to the Muromachi quarter of Kyoto. The Emperors ruled in name only; real power was held by a military governor, the shōgun. During this period, the Government reopened relations with China, which had been broken off almost three hundred years earlier. Japanese monks went again to study in China, and Chinese monks came to Japan, fleeing the Mongol invasions. The monks brought with them a new form of Buddhism, called simply Zen, or "meditation". The first zen garden in Japan was built by a Chinese priest in 1251 in Kamakura. Japan enjoyed a renaissance in religion, in the arts, and particularly in gardens. The Momoyama period was short, just 32 years, and was largely occupied with the wars between the daimyōs, the leaders of the feudal Japanese clans. The new centers of power and culture in Japan were the fortified castles of the daimyōs, around which new cities and gardens appeared. The characteristic garden of the period featured one or more ponds or lakes next to the main residence, or shoin, not far from the castle. These gardens were meant to be seen from above, from the castle or residence. The daimyōs had developed the skills of cutting and lifting large rocks to build their castles, and they had armies of soldiers to move them. The artificial lakes were surrounded by beaches of small stones and decorated with arrangements of boulders, with natural stone bridges and stepping stones. The gardens of this period combined elements of a promenade garden, meant to be seen from the winding garden paths, with elements of the zen garden, such as artificial mountains, meant to be contemplated from a distance. The Sukiya style was used in the most famous garden of the period, the Katsura Imperial Villa in Kyoto. The buildings were built in a very simple, undecorated style, a prototype for future Japanese architecture. They opened up onto the garden, so that the garden seemed entirely part of the building. Whether the visitor was inside or outside of the building, he always had a feeling he was in the center of nature. The garden buildings were arranged so that were always seen from a diagonal, rather than straight on. This arrangement had the poetic name ganko, which meant literally "a formation of wild geese in flight". The Meiji period saw the modernization of Japan, and the re-opening of Japan to the west. Many of the old private gardens had been abandoned and left to ruin. In 1871, a new law transformed many gardens from the earlier Edo period into public parks, preserving them. Garden designers, confronted with ideas from the West experimented with western styles, leading to such gardens as Kyu-Furukawa Gardens, or Shinjuku Gyoen. Others, more in the north of Japan kept to Edo period blueprint design. A third wave was the naturalistic style of gardens, invented by captains of industry and powerful politicians like Aritomo Yamagata. Many gardeners soon were designing and constructing gardens catering to this taste. One of the gardens well-known for his technical perfection in this style was Ogawa Jihei VII, also known as Ueji. During the Showa period (1926–1988), many traditional gardens were built by businessmen and politicians. After World War II, the principal builders of gardens were no longer private individuals, but banks, hotels, universities and government agencies. The Japanese garden became an extension of the landscape architecture of the building. New gardens were designed by landscape architecture school graduates, and often used modern building materials, such as concrete. Traditional Japanese gardens have small islands in the lakes. In sacred temple gardens, there is usually an island which represents Mount Penglai or Mount Hōrai, the traditional home of the Eight Immortals. 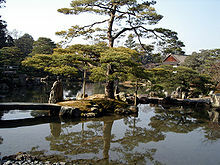 An island of weathered rocks and a single pine tree in Rikugi-en garden in Tokyo represents Mount Hōrai, the legendary home of the Eight Immortals. Such attention to detail can be seen at places such as Midori Falls in Kenroku-en Garden in Kanazawa, Ishikawa Prefecture, as the rocks at the waterfall's base were changed at various times by six different daimyōs. In Heian-period Japanese gardens, built in the Chinese model, buildings occupied as much or more space than the garden. The garden was designed to be seen from the main building and its verandas, or from small pavilions built for that purpose. In later gardens, the buildings were less visible. Rustic teahouses were hidden in their own little gardens, and small benches and open pavilions along the garden paths provided places for rest and contemplation. In later garden architecture, walls of houses and teahouses could be opened to provide carefully framed views of the garden. The garden and the house became one. The architecture of the main house of the Katsura Imperial Villa (1619–1662) was inspired by the simplicity of the tea house. Japanese stone lanterns (台灯籠, dai-dōrō, "platform lamp") date back to the Nara period and the Heian period. Originally they were located only at Buddhist temples, where they lined the paths and approaches to the temple, but in the Heian period they began to be used at Shinto shrines as well. According to tradition, during the Momoyama period they were introduced to the tea garden by the first great tea masters, and in later gardens they were used purely for decoration. Stone water fountain and cistern at the Japanese Garden at Norfolk Botanical Garden, Norfolk, Virginia. The use of fish, particularly nishiki-goi (colored carp), or goldfish as a decorative element in gardens was borrowed from the Chinese garden. Goldfish were developed in China more than a thousand years ago by selectively breeding Prussian carp for color mutations. By the Song dynasty (960–1279), yellow, orange, white and red-and-white colorations had been developed. Goldfish were introduced to Japan in the 16th century. Koi were developed from common carp in Japan in the 1820s. Koi are domesticated common carp (Cyprinus carpio) that are selected or culled for color; they are not a different species, and will revert to the original coloration within a few generations if allowed to breed freely. Concealment (miegakure, "hide and reveal"). The Zen Buddhist garden is meant to be seen all at once, but the promenade garden is meant to be seen one landscape at a time, like a scroll of painted landscapes unrolling. Features are hidden behind hills, trees groves or bamboo, walls or structures, to be discovered when the visitor follows the winding path. Landscape gardener Seyemon Kusumoto wrote that the Japanese generate "the best of nature's handiwork in a limited space". The chisen-shoyū-teien ("lake-spring-boat excursion garden") was imported from China during the Heian period (794–1185). It is also called the shinden-zukuri style, after the architectural style of the main building. It featured a large, ornate residence with two long wings reaching south to a large lake and garden. Each wing ended in a pavilion from which guests could enjoy the views of the lake. Visitors made tours of the lake in small boats. These gardens had large lakes with small islands, where musicians played during festivals and ceremonies worshippers could look across the water at the Buddha. No original gardens of this period remain, but reconstructions can be seen at Heian-jingū and Daikaku-ji Temple in Kyoto. Two hills covered with trimmed bamboo grass which represent Mount Lu in China. This feature is in Koishikawa Kōrakuen Garden in Tokyo. The first manual of Japanese gardening was the Sakuteiki ("Records of Garden Making"), probably written in the late eleventh century by Tachibana no Tohshitsuna, (1028–1094). Citing even older Chinese sources, it explains how to organize the garden, from the placement of rocks and streams to the correct depth of ponds and height of cascades. While it was based on earlier Chinese garden principles, it also expressed ideas which were unique to Japanese gardens, such as islands, beaches and rock formations imitating Japanese maritime landscapes. Painting of part of Landscape of the Four Seasons by the monk Tenshō Shūbun from the Muromachi period, showing an idealized Japanese landscape, where man was humble and lived in harmony with nature. This ideal landscape was also depicted in Japanese gardens. Japanese Garden of Peace at the National Museum of the Pacific War located in Fredericksburg, Texas. Germany: Augsburg (in the Botanischer Garten Augsburg), Hamburg, Leverkusen, Kaiserslautern, Munich (in the Englischer Garten). ^ a b Suga, Hirofumi (2015). Japanese Garden. The Images Publishing Group Pty Ltd. p. 6. ISBN 978-1-86470-648-2. ^ Gunter Nitschke, Le Jardin japonais, pg. 92. English translation of excerpt by D. R. Siefkin. ^ Miyeko Murase, l'Art du Japon, pg. 213–215. ^ Nitschke, Le jardin japonais, pg. 160–162. ^ a b Heyd, Thomas (2008). Encountering Nature. Abingdon, Oxen: Ashgate Publishing Group. p. 156. ^ "Garden and Landscape Design: Japanese". Encyclopædia Britannica (15th ed.). ^ "Aquatic-oasis articles". Aquatic-oasis. Archived from the original on October 16, 2008. Retrieved 2009-02-26. ^ For a review of Sakuteiki and various translations in Western languages see: De la Creation des Jardins: Traduction du Sakutei-ki by Michel Vieillard-Baron. Review in English by: Wybe Kuitert in Monumenta Nipponica, Vol. 53, No. 2, Summer 1998, Pages 292–294 https://www.jstor.org/stable/2385689 See also Sakuteiki: Visions of the Japanese Garden by Jiro Takei and Marc P. Keane. ^ Michel Baridon, Les Jardins, pg. 485–486. ^ "Gardens". University of Southern Queensland. Archived from the original on 15 April 2014. Retrieved 14 April 2014. ^ "Nikka Yuko Japanese Garden : Lethbridge, Alberta". ^ a b c d e f "UK and Ireland Survey". Japanese Garden Journal. 35. September–October 2003. Retrieved 2007-12-11. ^ "The Hotel". Kempinski Hotel Zografski Sofia. Archived from the original on 2011-07-16. Retrieved 2009-11-06.